Templates are ready to use blocks that consist of content elements and has a predefined structure. To access the Templates option, click on the template icon located in the Navigation bar. The predefined templates are premium templates that were downloaded from Visual Composer Hub. These templates are available either from Blank Page Wizard or Template window. Predefined templates are intended to cover the very basics of a website with different purposes and allow content replacement. In Visual Composer, you can distinguish two types of pre-defined templates – page templates and block templates (or section templates). To view predefined template before adding, hover the template thumbnail to trigger automatic preview. To add a template to your layout, hover the template thumbnail and click add (plus) icon. Note: Predefined templates cannot be deleted or modified from Visual Composer Website Builder. 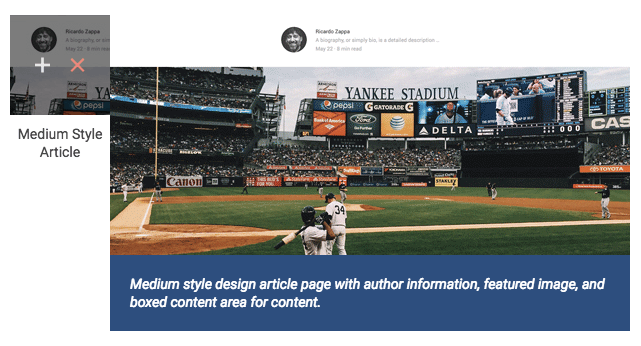 User templates option allows you to save your current content of the page as a template. All user templates are located under the Template window together with Predefined templates (with filter option available). Templates can be used to quickly save your layout and reuse it in another page, post or custom post type. After successful save, your new template will appear in the list of templates. Note: User templates will have a thumbnail generated automatically based on the first letter of your template title. To add user template, hover the template thumbnail and select add (plus) icon. The template will automatically be added to your layout. To delete user template from the user templates, hover the template thumbnail and select delete icon. Note: Free version of Visual Composer Website Builder does not have global templates. Updating the template will not change the content of the pages where that template was used.